Warnings about a forthcoming wave of retirements across large segments of the public sector’s most experienced workers have been bandied around for years. Labelled the “silver tsunami”, the anticipated mass retirement of baby boomers was expected to hit government in 2011 – however, the recession forced many to put their retirement plans on hold. While this gave government agencies a little respite, it only delayed the inevitable, for now it appears those retirements are accelerating across many state and local governments, as the long-awaited silver tsunami finally arrives. As noted by TranSystems, boomers are reaching the milestone age of 65 at the rate of 11,000 a day. And while it’s true that not all of them are in the workforce, and not all of them are retiring, the vast majority are – or will be very soon. 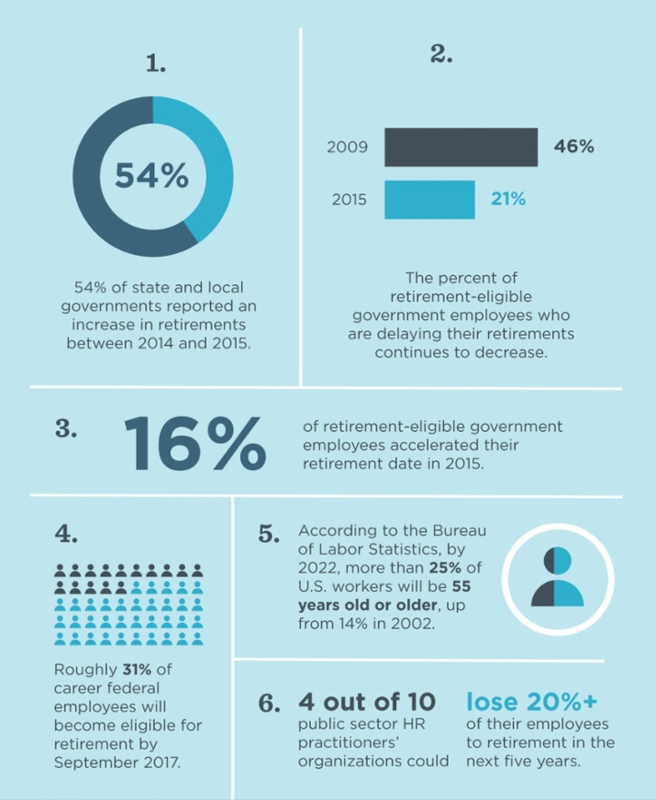 Indeed, according to a US Government Accountability Office (GAO) report, nearly one-third (31%) of career federal employees will be eligible to retire by September 2017. That’s nearly 600,000 members of the government-wide workforce. As the recession delayed retirements, the hope was that government agencies would use the additional time to put succession plans and leadership development initiatives in place, making the most out of being able to retain experienced employees for a few extra years. However, in spite of certain millennial outreach strategies and various other recruitment measures, the majority are still reporting a need for new leaders, as the public sector remains largely unprepared to deal with the wave of baby boomer retirements that is now finally hitting. Clearly, if a massive shortage of skilled public workers with deep institutional knowledge is to be avoided, HR needs to prepare, and, more importantly, identify solutions to act. There are new solutions emerging to help government agencies develop succession plans. Implementing phased retirement, for example, allows “silver” employees to begin their transition while transferring institutional knowledge vital to an organization’s resilience to a new workforce. In response, the county developed strict confidentiality guidelines that enabled the opening up of important discussions about knowledge transfer. “It allowed the employee and the manager to work together to identify what skills are important and how they let the next person taking the job know them before the person leaves,” Vaillancourt said. Leadership skills training initiatives are becoming increasingly critical in ensuring that the right talent is ready and prepared to take on empty boomer positions. Today, many government agencies are finding success with performance management software – such as NEOGOV’s Perform or the Cornerstone OnDemand solution – in order to asses potential leaders’ creativity, persistence, and innovation. 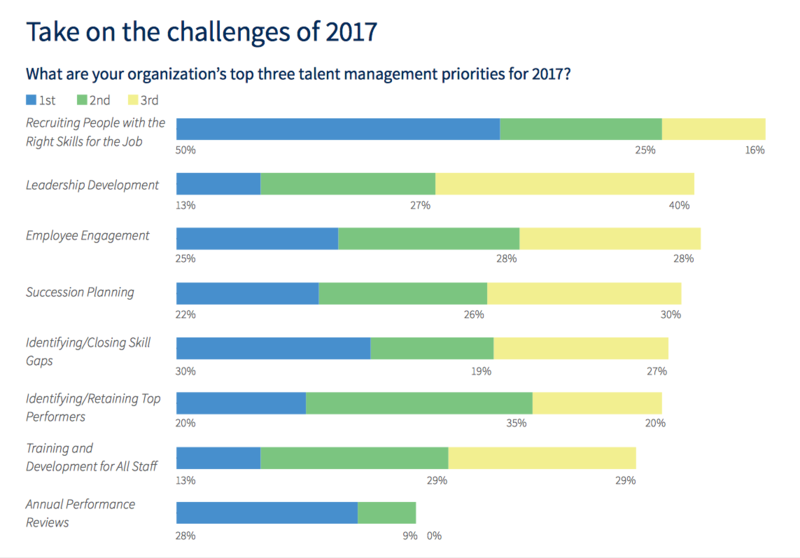 It should come as no surprise that, given the current situation, recruiting people with the right skills for the job is most commonly cited as the top priority for government employers in 2017, according to the latest figures from Cornerstone OnDemand in association with WBR Digital, published in the HCMG 2017 Benchmark Study. This is followed by identifying and retaining top performers, clearly demonstrating the acute need within agencies to preserve the accrued knowledge within their organizations by passing it on to the next generation of senior managers. Organizations need to focus on millennial programs and recruiting young workers who can be trained and nurtured to eventually fill positions being left vacant by the wave of retiring baby boomers. The challenge, however, is understanding this generation’s wants and needs, and how to keep them engaged and motivated. Some agencies have found success in utilizing government’s purpose – i.e. to serve the public – to promote job roles to millennials who are looking for a career where they can make a difference. Others are extending social media and digital outreach initiatives to target this generation on the platforms they are already using and familiar with. Either way, the most important thing for today’s HR agencies is to start developing strategies to deal with the silver tsunami, to begin ramping up efforts in recruiting new workers, succession planning, and leadership development initiatives, and ensure that key knowledge is transferred before a boomer’s last day on the job. The last word goes to Angela Bailey, Chief Human Capital Officer (CHCO) at the Department of Homeland Security. Succession planning, and leadership development are set to be hot topics at this year’s HCMG 2017, taking place in Westin Crystal City, Arlington, VA, this December.